When Steve and I first arrived in Greece, we were blown away by the beauty of its islands and how photo-worthy everything was! The typical Greek Cyclade island look is made up of clean white buildings, blue rooftops, stunning pink Bougainvillea flowers, vast views of the sea and sky, and stunning sunsets. Even though we are six months into our round the world travels, Steve and I hardly have any good photos of us together. When you rely on the skills and generosity of strangers to help snap a photo, they don’t always turn out so great. 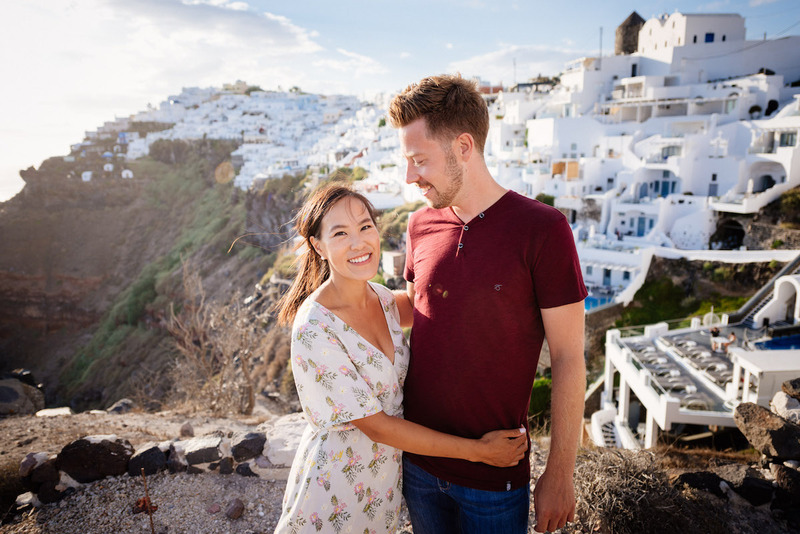 When we arrived in Santorini — the island rumoured to be the most picturesque in all of Greece — we sought out a photographer to do a couple’s shoot for us. We wanted some beautiful memories from at least one of our travel destinations, and in Santorini, a popular wedding and honeymoon destination, we knew the photos would turn out well, simply because the landscape is so scenic. In our eight years together as a couple, this is the first time Steve and I had ever had a staged photoshoot where we were the stars of the photos! We booked with Nikola Ancevski, a French photographer who lives half the year in Greece and spends the rest of his time travelling as a photographer. He knows Santorini inside and out and his quick and friendly responses to us via WhatsApp gave us the confidence we needed to book him for a one-hour Santorini photoshoot. Modern Mix Travel Tip: When looking for a photographer use Google and Instagram to begin your search. Look at the photographer’s portfolio of work and see if it’s a look and feel that appeals to you. The more consistent a photographer’s work is, the more likely your photos will turn out in the same style — no surprises. This was the first big decision we had to make with Nikola, which would set the scene for our photoshoot. In general, Oia is the iconic area that every tourist flocks to in Santorini. But Nikola had researched the cruise boat arrival times — three big ones arriving that day — and it was his professional recommendation to do the shoot in the nearby but less busy town of Imerovigli instead. Oia has more pops of colour, but the crowds would be way too intense to have a good Santorini photoshoot experience. Steve and I had checked out Oia the night before; we encountered tourists pushing and shoving for the best sunset view. Imergivioli, on the other hand, would be more peaceful yet equally picturesque with whitewashed houses on the hillside, blue domed churches, narrow alleyways, and sweeping views of the sea and the sky. Modern Mix Travel Tip: Trust your photographer. If he says a location is going to be too crowded (especially if he’s done research to back up his claim), trust his experience and go with his alternative recommendation instead. If you’ve hired a good photographer, he’ll know best — let him do the job you hired him for. When we met Nikola in person, he already had a route planned out. When our time together is so short — only an hour — it’s important to book with a photographer that has a plan — the last thing you want to do is waste precious time undecided on where to go, aimlessly wandering around the alleyways of Santorini. Whereas Steve and I may be too reserved to push through the crowds — Nikola does his job, taking the initiative to unabashedly asking other tourists to move aside, and guiding us through the crowds. These are my clients, would you please move for a moment so we can get this shot? 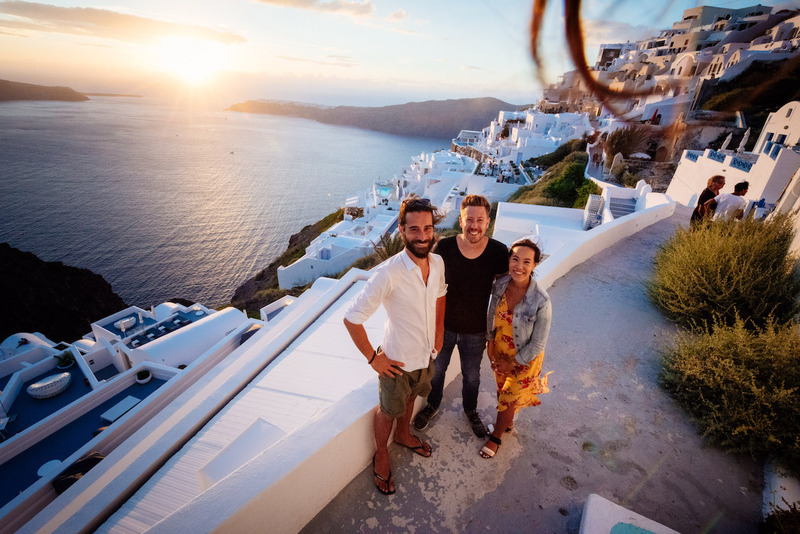 Nikola’s style is to shoot with an ultrawide lens, which totally makes sense for a photoshoot in Santorini when you’re trying to capture both the vastness of the landscape which surrounds the couple. Modern Mix Travel Tip: Know the type of couple you are — and communicate this with your photographer. Some things to think about: do you want more intimate shots (think: up close, kissing, dreamy, etc.) or do you want a more fun and flirty vibe (think: in-action walking shots, tossing head back and laughing, etc.)? Nikola took the initiative to firmly but politely push past the crowds so we could get this shot. There were at least 30 people behind us when this sunset photo was taken. Nikola picked up on our vibe as a couple pretty quickly. We weren’t into close up, intimate shots with grandiose displays of public affection. We were much more comfortable with a more casual look: walking up stairs or out of doorways; “an adventure” feel, he would call it! One of my favourite photos from the shoot — we are feeling like models in a fashion shoot! In our one-hour Santorini photoshoot, we even had time for a quick outfit change! If anyone is wondering, my pastel dress is from the Greek apparel brand Funky Buddha, and my yellow maxi dress is from H&M. 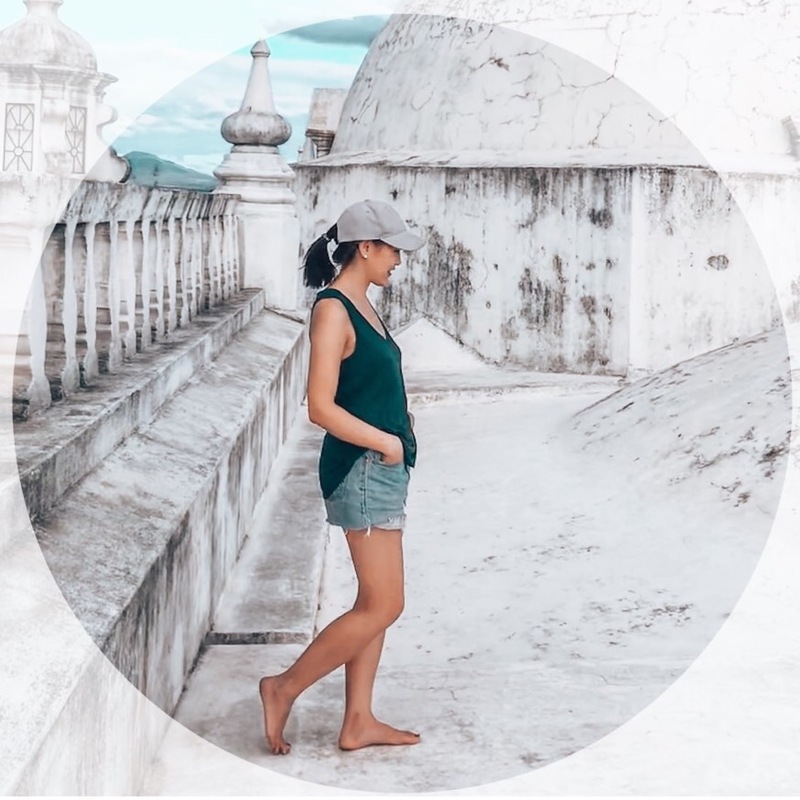 Modern Mix Travel Tip: Study poses in advance — you don’t want all your photos to look the same! Nikola’s advice was to take a look through Pinterest before the shoot for inspiration on how to pose. We received a Google Drive link to the 80 photos about two weeks later and loved looking through them. Overall we enjoyed our very first photoshoot experience together as a couple — Santorini is a uniquely beautiful place, and our photographer Nikola made it easy and fun. I can’t wait to get these developed and framed for our place back home in Vancouver. To book a Santorini photoshoot with Nikola, visit his website at: nikolaancevski.com. Rates begin at €80 for a 15-minute shoot with 10 photos. The most popular package is €240 for 1 hour with 80 photos. You look absolutely stunning Vanessa! That yellow dress!!!!! Wow! Your photos are gorgeous! I bet it definitely made the trip even more memorable. You’re making me want to go back to Greece! What an incredible idea. You’ll have these photos forever!